Busy busy busy! But no excuses! Anyway, the 17th was Dad's birthday, so he drew the name out of the hat! He actually drew out two names, and thus saved the issue for the next days face. 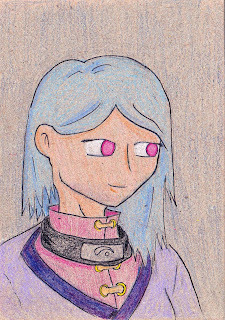 Anyway, he drew out Lady Kimiko, the leader of the village that Kiyo, Naoko and Sasumu belong to. So here is the 17th face! Day 17: Done! Onto the next (late) one! Very pretty, and the outfit, so nicely done!